Solutions do exist, though, and remain within reach to meet – and even surpass – the Paris targets and limit the impacts of climate change. « Nous disposons déjà de nombreuses solutions pour faire face à ce défi. Il ne manque que la volonté politique de la communauté internationale et l’acceptation d’une évidence: le temps presse» a stated Erik Solheim, Executive Director of the United Nations Environment Programme (UNEP). In Canada, the main way to reach our GHG reduction objectives is to implement the climate plan. Renewable energy creates 15 jobs per million dollars invested, as opposed to 2 jobs in the case of fossil fuels. 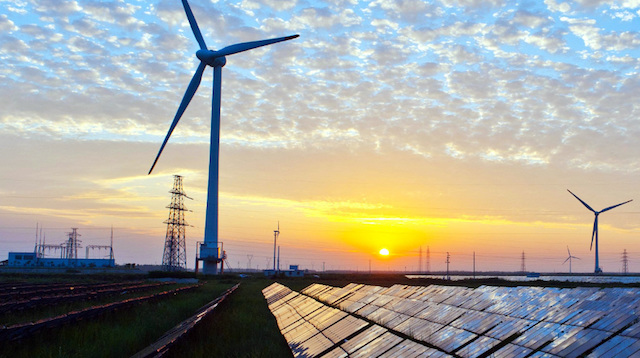 By the year 2014, the renewable energy sector alone had created 7.7 million jobs worldwide! 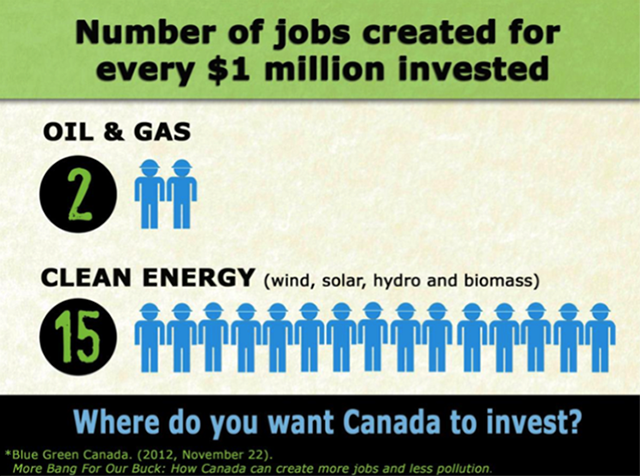 If $1.3 billion were invested in renewable energy, energy efficiency and public transit, six to eight times more jobs could be created in Canada, amounting to 18 000 to 20 000 jobs in the clean energy sector versus 2 300 jobs in the oil industry. In the solar energy sector alone, the number of jobs created per unit of energy produced is 15 times higher than in the natural gas or coal sectors, and 12 times higher than in the nuclear energy sector. What is more, one job created in the natural gas or coal sectors costs six times more money than the same job created in the solar energy sector. Stop investing in fossil fuels, starting with the $3.3 billion in taxpayer money that Canada uses to subsidize this sector. According to the International Energy Agency, oil, gas and coal are 500 times more subsidized worldwide than solar, wind or biomass energy. Il existe encore 6 683 centrales à charbon dans le monde! One sure way to reduce GHG emissions is through the electrification of transportation, be it in the form of vehicles used to transport people (personal vehicles, shared vehicles, mass transit) or cargo. Quebec is the first province to have adopted a zero-emissions law and has assumed a pioneering role in North America. In Canada, the government’s future National Zero-Emissions Vehicle Strategy represents a unique opportunity to make electric vehicles (EVs) more accessible to the public by offering a selection of models comparable to those on offer in the United States (and California in particular), which is not the case today. If Ottawa requires that a set percentage of the vehicles sold in Canada be electric, automobile manufacturers will be obliged to offer Canadians more EVs for purchase or rental. Research has shown that if more EVs are offered to consumers, they are more inclined to buy them. Other solutions have also been identified at the international level in the 8th edition of the UN’s annual Emissions Gap Report, which focuses on the gap between necessary and likely reductions in emissions. Drastically curtail emissions of CO2 thanks to mitigation measures in rapidly developing countries based on existing models in the areas of agriculture, buildings, energy, forestry, industry, and transport. Strong measures to curb climate pollutants like hydrofluorocarbons via the Kigali Amendment to the Montreal Protocol, as well as other short-lived pollutants like black carbon. This could go a long way toward reducing emissions of CO2. To achieve the Paris Agreement objectives, governments (by boosting their commitments, for example), the private sector, cities and the other stakeholders absolutely must continue to implement the measures put in place, which will lead to deep and rapid emission reductions. The report details different ways of going about this, especially in the areas of agriculture, buildings, energy, forestry, industry, and transport. Investment in technologies specific to these sectors – at a cost of less than 100 dollars per tonne of CO2 avoided, and often far less – could help avoid up to 36 Gt eq-CO2 per year by 2030. Much of the potential reductions in the sectors as a whole stems from investment in solar and wind energy, energy-efficient household appliances and personal vehicles, tree planting and a halt to deforestation. If industry focused solely on the actions recommended in these sectors – the costs of which are modest or even negative – emissions could be reduced by up to 22 Gt eq-CO2 by 2030. These reductions alone would put the world on the right path to achieving the 2°C objective and would pave the way for possibly reaching the ambitious target of 1.5°C.